Ryan Graudin is quickly becoming one of my favourite authors, and for good reason. After diving into The Walled City and resurfacing with wide eyes and an oh, this book was good, I promptly kept her name on the top shelf of my internal list: authors-to-look-out-for – and then Wolf by Wolf appeared on my doorstep, with a quote from Laini Taylor on the front cover (a clear sign that this book must be read), at the wrong time, during exam season when TBR lists were not a priority, stress was out in full force and taking over even the most organised of lives (aka me) and reading books was not an activity I could dwell on before feeling guilty that I was wasting time. It was May, and I hadn’t read a book since last summer (although if you count a re-read, the winter holidays; or if you count the assigned English play I had to study for my exam, fairly recently – I read it around five/six times). It was the direst of times, and Wolf by Wolf’s blurb was captivating. But I could not turn its pages. Yet. Wednesday 13th July. Summer holidays, on holiday – time to read. And one day later, the last page had been turned. I had been starting to fall out of love with YA, until I read this book. Germany, 1956: OVER TEN YEARS SINCE THE NAZIS WON THE WAR. five wolves with charcoal fur and inky eyes, leaping down her arm, waiting to be released, waiting to be avenged, waiting to be set free. Dr. Geyer: an angel of a different kind. Silver tray, scalpel, needles; blood on his head, in his veins, under his nails. And he created a monster? Wolf by Wolf is a story about identity, about pain, about power, about desperation - about humanity, & Graudin writes with a needle: scratching at the surface of your skin as you read, leaving marks behind. The way the words weaved together into webs of a b c d e f g and created living, breathing people is what captures you. At first, the story: the intrigue of what we already know told in a different way – and then this shifts, into you and them - paper humans and hasty fingers stumbling over pages: into Then and Now. No distance between you and the characters, just the distance between here and the finish line. To be expected: alternative history, motorcycles, sabotage, relationships, friendships, enemies, complications. To be (un)expected: a shift in genre, a twist – an ability to re-tell a piece of history that has been fed to us in overflowing spoons often, and stir up a compelling, captivating, new way of narrating. 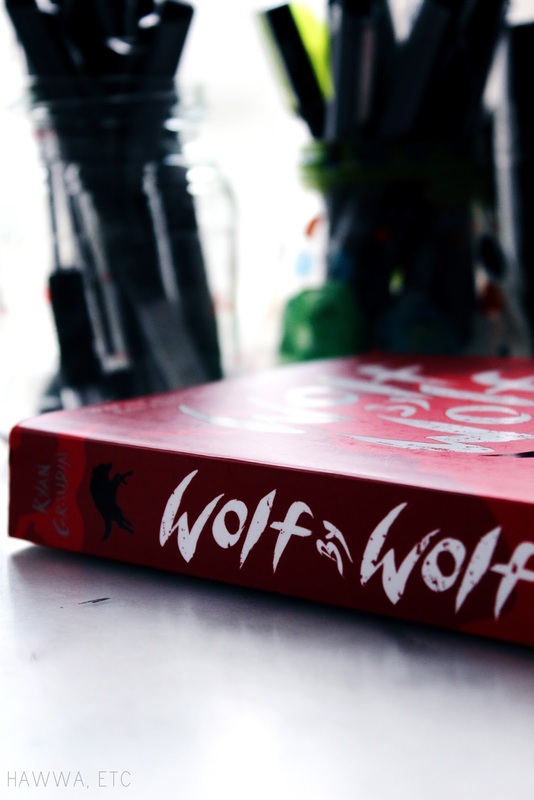 Wolf by Wolf, life by life, step by step – I did not plod to the finish line of this book, I flew - just like Yael. I have heard such beautiful things about this book, and the premise is absolutely gorgeous - I know I must read it as soon as I can. Thank you so much for sharing your review, Hawwa. Isn't it a magical thing when we find books that rekindle the sparks of love for genres we'd very nearly lost? It is so so good, and her other book, The Walled City, is realy good too. Thanks so much, and yes yes yes! This is such a beautiful review and I so badly want to read this book now! I've heard such great things about Graudin's books! YOU MUST READ IT, and yep, I'm eagerly awaiting her next! Oh wow! Brilliant review! I really want to read this now! thank you! you definitely should. Excellent review as per usual! WHAT, CAIT. READ IT. (I hope you like it..I will wait for your review..) PICK IT UP, IT IS GLORIOUS and yessss, I neeeeed it.